“Show bikes” are always tough. As a builder, you often get invited to show off some company’s new products on a carefully built frame. It is an opportunity to be seen with the latest and greatest, but also an opportunity to show off as a builder, what you have to offer. You’ve likely seen myself and other builders putting out the gorgeous builds at shows and on the internet, decked out in the most expensive parts that money can buy. Those parts no doubt ride wonderfully, but as someone with a small brand and a voice in the industry I really want to make cycling a more inviting place. That is a hard thing to do when all I ever show are $15,000 bikes like these show bikes I am talking about. For that reason I decided to bring a nice simple bike to the King openhouse. This 29er “klunk” inspired singlespeed is a nice versatile bike that is going to last its’ new owner a lifetime. This bike is designed to be simple and easy. Low maintenance with no gears, no suspension and mechanical disc brakes form Paul Components. You can hop on with out a worry and be on your way. That said it is ready to see some more serious duty with the option for gears and different tires sizes. From exploring townie trails to towing kids in a chariot, to weeklong bikepacking trips this is a great one bike to have and cherish. With a big birthday on the horizon, David got in touch about a new custom mountain bike that he could take riding near his home in the Santa Monica mountains of California. David has been riding bikes for a while and knew what he wanted. Something that maintained a lot of the cross country efficiency of his current mountain bike, but something that would handle those chunky California downhills with a little more ease. We went with 27.5 x 2.8 rubber to keep things nimble and cush. The rigid fork is suspension corrected so that David can easily swap it out for a 120-130mm fork when he decides he wants that. Sliding dropouts from Paragon Machine works also makes swapping between single speed and gears a breeze. As David put it, he wanted a mountain bike to ride for the next 25 years and this is a great example of a versatile bike that can grow and change with you through different gearing, wheel sizes, suspension setups. A bike for the ages and something I am happy to put into the world. 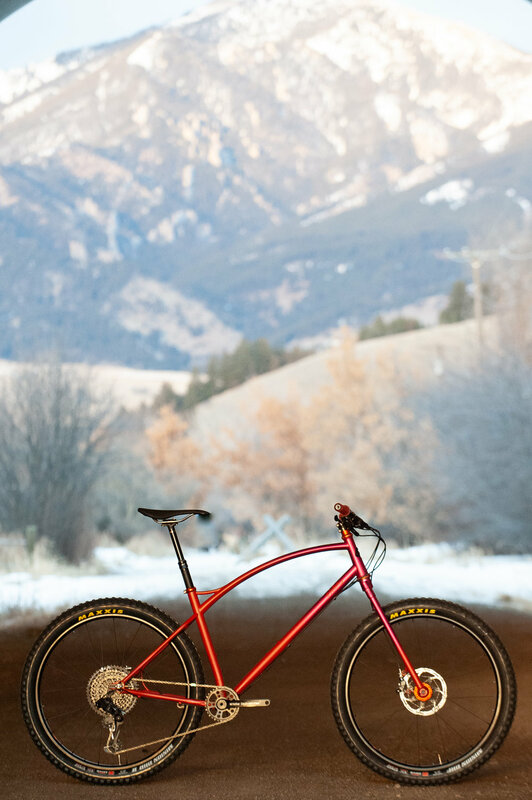 The build was topped off with a killer fade from Spectrum Paint and Powderworks, Sram Eagle 12 speed, White industries cranks, Paul Boxcar stem, and that full bearing kit from Chris King in their new matte mango color option. 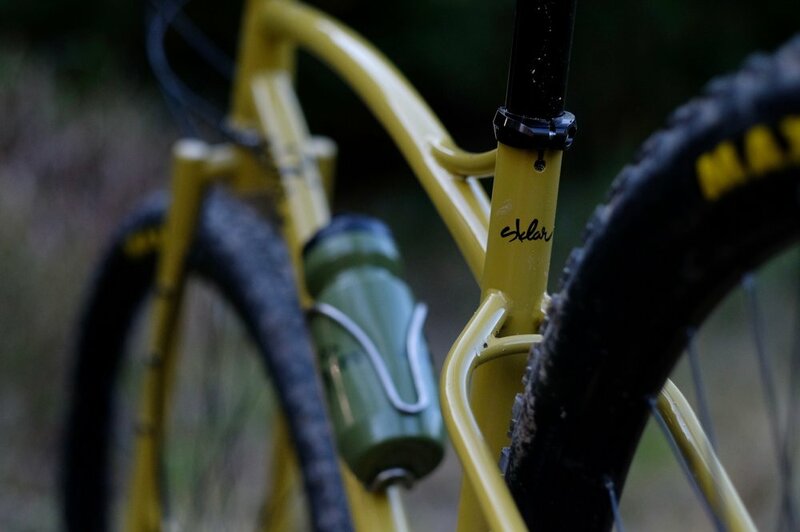 Learn more about Sklar custom steel mountain bikes here. Alex is one of my best riding pals, so building bikes for him is always fun. We do really similar riding here in Bozema - a mix of long logging road climbs, super rough rocky descents, smooth flowy singletrack and everything in between really. Often we ride from town too, so some efficiency is nice. That is why we went with a Ti frame, for that ride livelieness and to save a little weight. 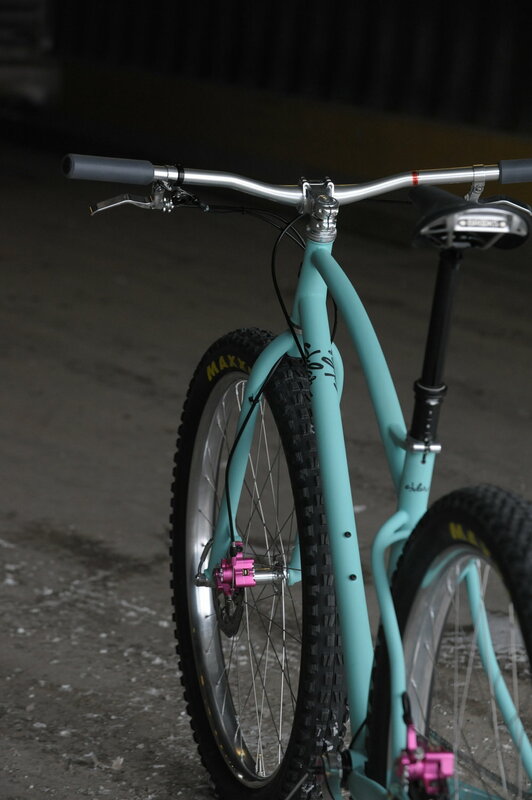 The bike is built around 29x2.6” wheels. I love that wheel size. It has a lot of the advantages of a plus bike without the crazy rolling weight and excessive rolling resistance. If there is a happy medium, this is it. 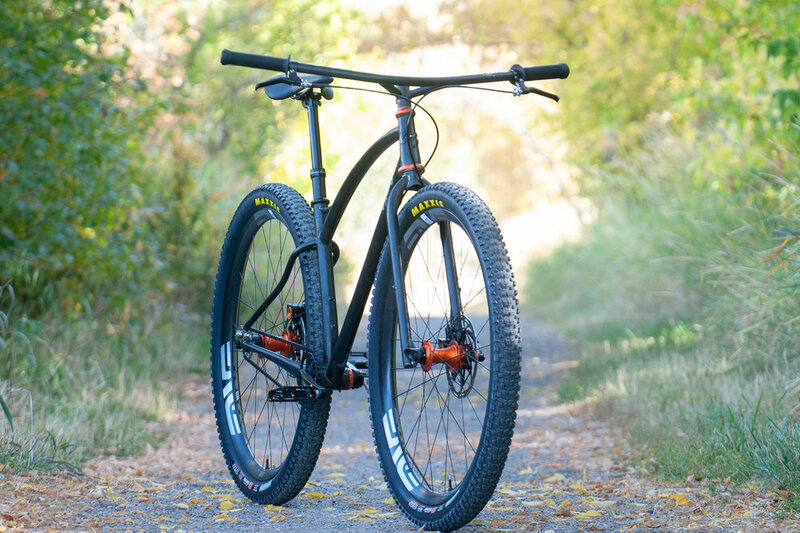 The build on this bike is just what I would run on a bike like this too - great wheels from Industry Nine, the trail 270 is a nice width for this tire. I’ve found the stiffness and durability of these wheels to be really awesome and their pricepoint is sort of unbelieveable for the quality and the fact that they are made in the USA. This is my go-to for an alloy MTB wheelset. We went with other good MUSA parts from White Industries on the cranks and headset, a Paul stem of course, Fox suspension and the Eagle GX Group from SRAM. Killer build. Anyhow, it has been fun seeing this thing shredding around this summer! I think my next MTB will look a lot like this. It is exciting to get to know folks through building bikes, and Mark is one who I have gotten to know pretty well. This is the third Sklar headed to his household down in Durango, CO and I could not be more excited. Mark has been romping around on my old 29+ singlespeed for the past few years but he was ready to trade it in for something fresh. This is what we came up with. A little more "modern" XC geometry. Something Mark can shred around Durango every day. It is set up dedicated Singlespeed with Paragon Machineworks sliding dropouts, a PAUL SS hub and White industries freewheel - old school! If Mark ever decided to put on some gears though, the frame has routing for a rear derailleur and it is as simple as swaping out the drive side slider. So easy! I am excited for Mark to get out on this bike, I know that he rides a lot and I know that he rides well. I am hoping to make it down to Durango at some point and see it there in its natural habitat. This custom mountain bike project was a fun one! I received a call a few months back from fellow named Keith, who was looking for a birthday present for a friend of his. Sounds like a good friend, eh? We worked together to plan out this awesome mountain bike for Hossein to ride. 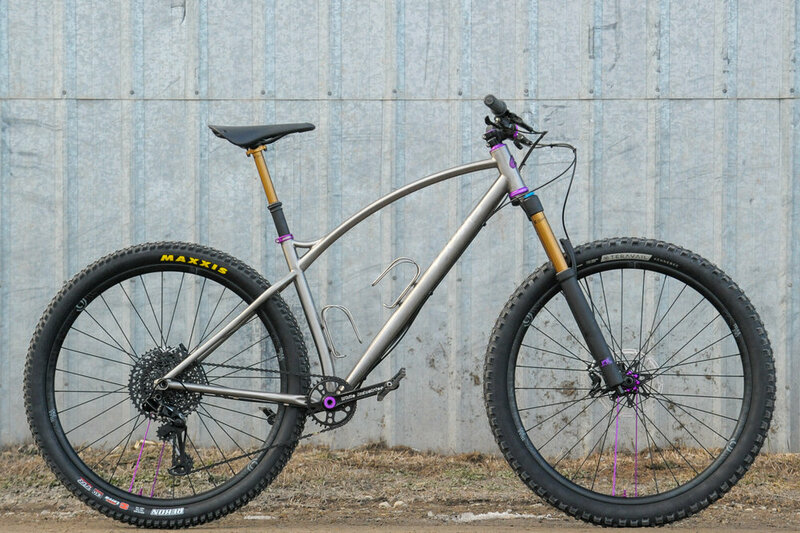 The custom titanium frame is designed as a nice all arounder that will shine especially well on the long flowy trails with occasional techy sections - where it will mostly be ridden. The plus tires (seated on Enve's M6040 plus rims) should provide lots of comfort and traction and the 140mm fork won't let it get pushed around. We went with a Shimano 1x11 drivetrain and a OneUp Components cassette extender. Hossein really likes the Shimano interface, but wanted that big gear for slow spins up long climbs. Lots or Made in USA Components like the White industries crankset and headset as well as King hubs and a PAUL Stem top off the build. Good stuff all around! This bike screams dream bike, or at least it does to me. It was a really fun ride to build and I can not wait to see it put to use! 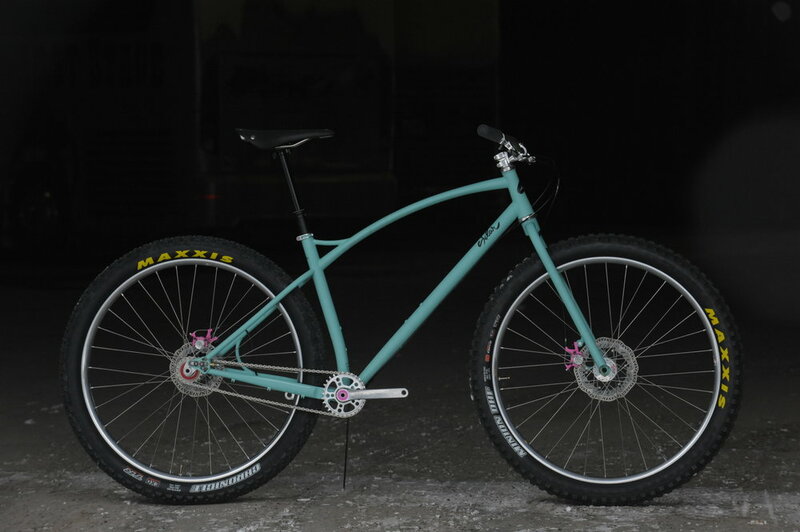 See more custom mountain bike builds here. This build is fresh from Circles & Co in Japan! This custom steel 29er mountain bike frame was designed to be a versatile all around ride. Using Paragon Machine Works sliding dropouts the bike can be run as a single speed, or be run with gears as pictured with a Shimano 1x11 speed drive train. The Signature swoopy front triangle provides a nice comfy ride while also allowing extra space for a frame bag. The custom segmented and tapered steel fork will make for a nice comfy ride and the anything cage mounts provide space for hauling extra gear on long bike packing trips. Circles chose the awesome curry-colored paint and decked out the build with awesome components from Chris King, White Industries, King Cage and so many other good bits. This should be a great bike for Mr. Murata in Nagoya, and I am excited to see it shredding around Japan! For more information on custom mountain bikes and pricing, see the info page here.